There is good news for the people of Manchester who are suffering from hair loss issues. To get rid of your hair loss problem on a permanent basis now you can find various hair loss therapies in Manchester. We offer an array of treatment tailored to your specific needs and requirements from our various treatment packages. Although people say that beauty is skin deep, the statement is not true and Hair loss or alopecia is the thinning of hair on the scalp that can be temporary or permanent. The most common type of hair loss is androgenic alopecia and the second one is alopecia areata. Some other types of hair loss occur due to sudden weight loss, talogen effluvium, traction alopecia and fever. However, hair loss can also occur naturally with age. An alternative to surgical hair transplant procedure, non surgical hair treatment is suitable for those who don’t want to opt for a surgery. These include tablets, creams, lotions, lasers, etc. Some other non-surgical procedures that are suitable for both men and women that can give effective results such as PRP therapy and mesotherapy. Such treatments are non-invasive, non-surgical and pain-free and are cost effective as well. To alleviate the hair loss problem one of the most effective ways is to opt for a surgical hair loss treatment. In this, hair is individually injected into the scalp for a period of time. In most cases these procedure are expensive and painful compared to non-surgical treatments. However, they are very effective and success rate is high. In Manchester, where everyone is suffering from hair loss due to environment and other reasons surgical hair loss treatment is a good option. Such treatments are suitable for men who are suffering for male patterns baldness and women who are suffering from hair thinning or female pattern baldness. There are many kinds of surgical hair loss treatments such as FUE and FUT hair transplant. The useful advice and treatments offered will help restore your hair all over again. Understanding the root cause of the problem of your hair, you can make sure to receive hair restoration treatments from the expert professionals. Whether you have scalp issues or scalp irritations, you will be provided with every type of hair-connected treatments applied for men and women of all age. The right medications and medical assistance are sure to give you the desired result you wish for. With a wide range of hair treatments and solutions, you can heave a sigh of relief from the problems of hair you have been facing for so long. Make time to visit the specializes doctors and surgeons who are available to give you a satisfactory result for your hair problems. The renowned doctors and consultants are even ready to root out all the hassles of your hair by using exclusive hair care treatments. The highly experienced hair doctors in Manchester will give you an in-depth hair treatment programs.Knowing the medical history of your problem, you will get the right diagnosis from the efficient consultants and doctors. Depending on your hair type and the hair issues you are going through,you can expect to receive the best hair treatment plans from the qualified doctors. After going through a thorough medical examination of your hair, you will be given the desired hair treatments required for the medical procedure. A scalp stimulation therapy, proper dietary plan, or medications, all types of measures will be executed for providing you a better result. You can make sure to procure scientifically proven hair products to increase the growth of hair naturally. The pro clinicians and the elite team will cater the advanced treatments and hair transplant, if necessary. Situated in Manchester’s medical district, our Manchester Clinic consultations take place in the clean and contemporary Bridgewater hospital. Free parking is available on site with additional parking next door at Asda. The hospital is also well served by local bus routes making us easily accessible however you decide to travel. A) Patients who had undergone severe hair loss have found a considerable difference in their hair growth after using the hair treatments of Manchester. B) With several sitting and a series of consultation, patients with hair loss issues are happy with the new result. C) People who had a problem of receding hairline is now elated by the life-changing result of hair growth seen after the use of high-powered hair treatments. Nu is proud of the clinical expertise and client services that we offer. The clinic manager, Stephanie, has worked in the cosmetic industry for over 5 years and has extensive knowledge in hair loss procedures. 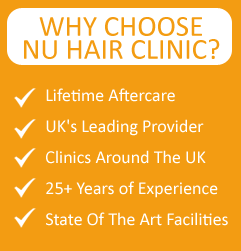 At Nu Hair Clinic Manchester, you can access the best free consultations with expert surgeons to ensure you have all the information you require to make the decision that’s right for you. The strength of Nu Hair Clinic Manchester lies in its expert team of professionals who not only possess core knowledge about the procedures but are also excellent in dealing with the customer queries. Stephanie, the Clinic Manager is doing a remarkable job here with her valuable 5 year experience in the Cosmetic Industry. She has in depth know-how about hair loss treatments which equips her with confidence and perfection in the job.With the presence of Nu Hair Clinic, Hair Transplant for men and women in Manchester & other cities in UK has become a cake walk. With our team of most expert surgeons from all over the world, there is no room for complaint about the perfection of the treatments. We provide tangible results not only on paper but also in reality. We make it a compulsion to provide equal attention to each and every customer of ours. Our professionals take care of the patients very religiously in all the stages of the surgery that is from the pre surgical stage to the post surgical stage. Our reasonable prices for the treatments are another reason for our widespread acceptance and success. In our clinic, both surgical and non-surgical hair treatment methods are available. Follicular Unit Extraction (FUE) is a very popular surgical treatment for hair thinning and baldness. We treat hair loss not only for the scalp but also other parts of the body. Facial hair transplant in men is a much demanded treatment here. Eyebrow restoration treatments in our clinic are also rapidly gaining popularity. The non surgical treatments that we offer also provide excellent results in both men and women. Mesotherapy and Platelet Rich Plasma Therapy are the most widely demanded non surgical treatments in our clinic. These are kinds of medicinal treatments with massage that initiates hair growth from the follicles.